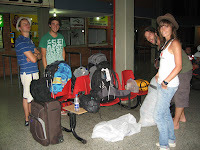 Let me tell you a bit about traveling by bus in Colombia (photos forthcoming). First of all, we are not talking rusty old open-air trucks with caged chickens on the roof and 30 people packed into 10 seats. Hardly! These inter-city buses are super deluxe coaches with cushy seats, full power air-con and movies galore. And thankfully so, since the lack of trains leave little alternative. Walk into a bus terminal, and you are immediately hounded by uniformed reps from the many bus companies whose purpose is to sell you a seat. Santa Marta? Cartagena? Para adonde vas? they all yell out to you. It's a bit dizzying, but if you can stay focused you know to go straight to the ticket counters. Check around before making any commitment: there is a lot of competition with so many companies taking the same route, so prices can be somewhat negotiated. But we are already in the cheap anyway (example: $27 for a 13 hour journey). Waiting for the bus, there isn't much to do other than eat some of the many sweets made of arequipe (caramel), watch one of the dramatic telenovelas that consistently blares from the TV, or use the loo. You may be shocked to hear that the bathrooms at these terminals can be surprisingly clean, but entry is guarded by a very bored-looking attendant. What a job. 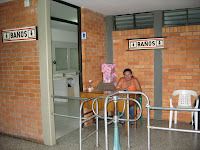 To enter the facilities, you must hand over a handful of pesos, average 25 cents. In exchange, you might get a smile, and you will definitely get a small stack of toilet paper. The San Gil bus terminal charged all of 35 cents to use their bathroom, maybe because the stack of toilet paper was sealed and stapled inside a little plastic baggie. 10 additional cents for the sanitation measure. Worth it. Something I need to investigate is whether men are charged as well... And do they get toilet paper? Or even a smile? Once the coach pulls in (right on schedule), bags are tagged and loaded securely underneath as everyone scrambles to get a good seat. A vendor or two walk through the aisle, selling cold drinks, snacks, sandwiches, empanadas, you name it. A movie starts to play, but to my dismay it's Taken once again. I love this movie, and of course love Liam, but I just saw it on the last bus ride and it's a tough movie to watch when traveling solo. So instead I pop in the earplugs, pop some Ambien, and lay back to hopefully sleep through the very long ride ahead. Destination? The beach.